We've published almost 200 Refcardz to help you write better code. This week we're kicking off a new series to help you make sure you haven't missed anything. This week we're launching a series of checklists for software developers -- quick, pragmatic, and thorough, and (when the topic warrants it) paired with a template to help you build a custom checklist for your particular applications and environments. 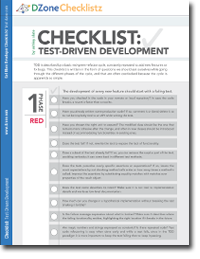 Our first checklist covers Test-Driven Development (TDD) -- a short-cycle agile technique, focused on ensuring quality as soon as feature development begins. Check it out and let us know what you think. Feel free to request another topic, too.